Course Dates Choose an optionDec 7-9, 2018 (Fri-Sun)Dec 14-16, 2018 (Fri-Sun)Dec 21-23, 2018 (Fri-Sun)Dec 27-29, 2018 (Thu-Sat)Jan 4-6, 2019 (Fri-Sun)Jan 7-9, 2019 (Mon-Wed)Jan 11-13, 2019 (Fri-Sun)Jan 14-16, 2019 (Mon-Wed)Jan 19-21, 2019 (Sat-Mon)Jan 25-27, 2019 (Fri-Sun)Feb 1-3, 2019 (Fri-Sun)Feb 11-13, 2019 (Mon-Wed)Feb 16-18, 2019 (Sat-Mon)Feb 22-24, 2019 (Fri-Sun)Mar 1-3, 2019 (Fri-Sun)Mar 8-10, 2019 (Fri-Sun)Mar 11-13, 2019 (Mon-Wed)Mar 15-17, 2019 (Fri-Sun)Mar 22-24, 2019 (Fri-Sun)Mar 29-31, 2019 (Fri-Sun)Apr 5-7, 2019 (Fri-Sun)Apr 12-14, 2019 (Fri-Sun)Apr 19-21, 2019 (Fri-Sun) Click here to clear options to view dates for all locations. 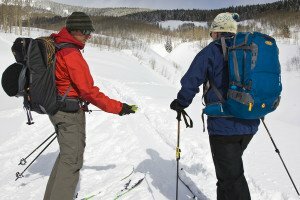 Learn how to make better decisions in avalanche terrain with the Colorado Mountain School. We teach a complete program of curriculum established by the American Institute for Avalanche Research and Education (AIARE) and are the world’s largest and most experienced AIARE provider. This AIARE 1 course is a three-day / 24-hour introduction to avalanche hazard management. Our instructor team is made of experienced AIARE instructors and professional mountain guides with decades of experience in avalanche terrain, from the Alps to Alaska to right here in Rocky Mountain National Park, one of the country’s premier winter adventure destinations. In addition to classroom work, our course includes field instruction each day. Field instruction provides a well-rounded education to backcountry decision-making, trip planning, terrain selection, and companion rescue techniques. This course provides essential training for anyone traveling in avalanche terrain. We allow participants to take this course on backcountry skis, split board, or snowshoes. With a maximum ratio of six students per instructor, we exceed AIARE minimum standards to provide the highest level of instruction. *Please refer to course email to determine the meeting location for your course. With a sixteen-bed lodge available, Colorado Mountain School provides students the opportunity to spend their entire stay in Estes Park without the hassle of commuting. Our lodge is conveniently located in downtown Estes Park and features a full kitchen, WiFi and hot showers. Reserve a bed now for just $40 per night (plus tax). All of our courses can be run as custom outings. If your group is interested in a custom avalanche training course, please call us at 720-387-8944. This course can be taken on snowshoes, skis, splitboard, or snowboard. Participants on alpine touring rigs must have experience on their setup prior to taking this course. Snowshoes are available for rent upon request. Students on skis or boards must be comfortable in steep blue to black terrain at the areas. Useful for navigation courses, including hiking and ski tour planning. There are a plethora of apps that assist in navigation. These apps use your phone's GPS functions and can work in the mountains offline. Great for walking over snow. Snowshoes work by distributing the weight of the person over a larger area so that the foot does not sink (posthole) into the snow. I want to thank you for all your help leading up to our courses last week. You made sure the whole process was fluid. I also want to let you guys and Mr Russel know that I had an amazing time this past five days. From the hostel stay, to Buster teaching me to work my slidey sticks (Wes’ name for them) uphill to the AIARE class. The four guides that taught that class are a special group of people and I am very grateful for that. Karin, well, just badass…so engaging while speaking, made the whole class a blast to be a part of it, this woman has such a wealth of knowledge and the passion she has for sharing that shows through in the best of ways. Everett, I wasn’t exactly sure about him in the first few hours of class, but quickly found out that I think he likes that!!! E was such a good teacher in the field, I was right at home in the snow pit geeking out snow science with him, this dude knows his stuff and just like Karin, wants to share it with whomever asks. Ed….ol Ed…I did not have the pleasure of getting Ed in the field this go around, but while he was teaching in class, he has a way of making his point stick, very good instructor in class. Last but absolutely not least there’s my man, Wes…Wes is exactly the perfect ingredient to the mix. Stone cold serious about the course content, but super FUN while doing it. You know when this guy is being serious, but he keeps it light and entertaining, another good science geek time in the pit with W. I cannot stress how happy I am with the course we took. This mix of people just absolutely hit home with me, and I am certain the rest of my classmates would agree, the whole class was involved, the way it should be…. This is such serious and heavy content to be learning and taking in, and these four amazing individuals made it so that I could enjoy the whole process as opposed to be being just hit over the head with it all weekend. My friend Matthew and I both left feeling EMPOWERED thank you again for everything and we will absolutely be back for more instruction from this school!!! This 3 day AIARE 1 Hut Trip will take place at the Broome Hut on Berthoud Pass in Colorado, or at the Lindley Hut depending on which hut trip you book. Enjoy the luxury of a warm hut and alpine skiing.